This section provides statistic charts about your site activities such as: how many users have signed up, how many places have been posted, and how much revenue you have earned. You can see this overview on different time ranges: 2 weeks or all time. It will be a great tool for admins to track their site content. 2. General information and content. This section allows you to set up general information for your site. Choose Engine settings > Settings > General. Email confirmation: If you enable this option. 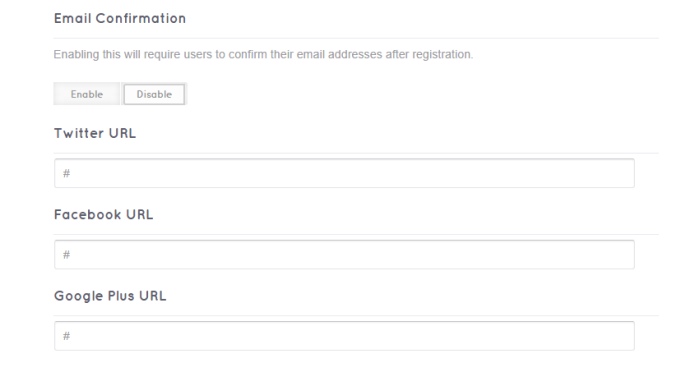 Users have to confirm their email addresses to complete their registration. Twitter/ Facebook/ Google plus URL: These URL are displayed in the “DE social” widget, you can add this widget to the suitable sidebar to appear in the front-end. 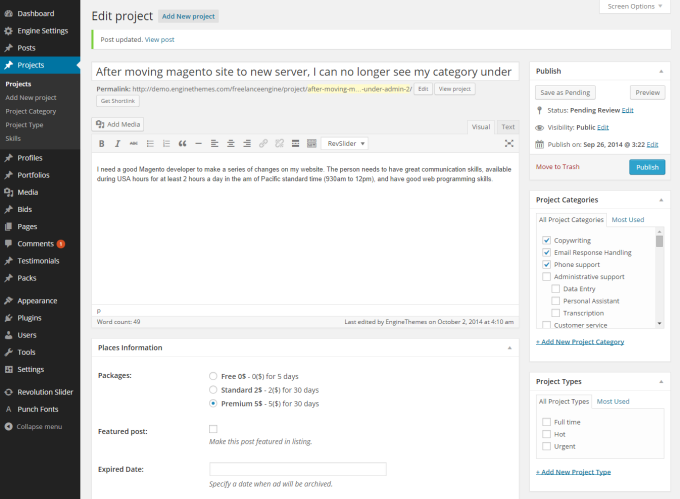 This section allows you to manage the content settings in your site. Choose Engine settings > Settings > Content. You can set up the currency for the users to decide their project’s budget. Based on your preference, you can decide the suitable currency used for your site. You can insert the currency’s code, sign as well as decide which side it’ll appear. For example: Are you wish to use USD for you payment, you can set it up as following. In this field, you can set up the limitation of the "Budget" filter in "Projects" page. You can prevent inappropriate posts appear on your site by enabling this function. After that, a post has to receive your approval before being displayed in the front-end, which means you absolutely keep your site stay away from unsuitable ones. - In the front-end: visit the “Projects” page, check the “Tick” button to approve the project. - In the back-end: visit the “Projects” tab, click on the posted project and “Publish” it. This section allows you to insert all the slugs for your site. Choose Engine settings > Settings > URL slug.